Atareb, northern Syria. A young boy, covered in dust, is pulled from the rubble of a building. He is small against the backdrop of destruction, and terror reads widely on his face. You may recognise him. 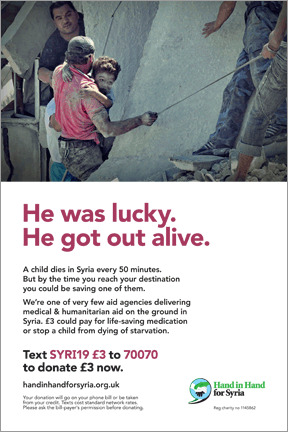 Over the past few weeks, his image has been on London’s public transport system as part of Hand in Hand for Syria’s first tube and bus campaign. Covering over fifty key London underground stations, as well as a large number of bus routes, the campaign used London’s transport as a medium for showing how quick and easy it is to donate, and what a difference even a few pounds can make. “A child in Syria dies every 50 minutes. But by the time you reach our destination, you could be saving one of them,” the poster reads. The young boy’s image is shocking enough on its own – but the sad truth is that reality is so much worse. Over 140,000 have been killed – of which 11,420 were children. 6.5 million people within Syria are internally displaced, coping with the difficulties of life away from home alongside the harsher dangers involved in navigating a war-zone. 4.5 million of these are children. Food shortages are resulting in increasing numbers of children dying of starvation, with newborn babies particularly vulnerable. With vaccination programmes at a standstill, combined with crowded conditions in makeshift housing and malnourishment, many are suffering from life-threatening diseases such as hepatitis A and polio. Tragically, even treatable illnesses such as diarrhoea are now proving deadly, owing to a lack of basic medicines within the country. For many parents, nothing can be done, and they must simply watch their loved ones lose their battle with life. The crisis in Syria is now in its fourth year, and every day, more heart-breaking stories emerge. 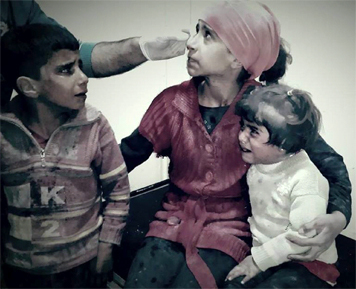 These three terrified children were recently brought into our Atareb General Hospital. They had survived a barrel bomb which destroyed their home near Aleppo. Sadly, their sister was killed instantly. As one of the only aid agencies operating on the ground in Syria, there are things that we can do to help. In the past 2 years, we have opened 6 hospitals, and we are simultaneously supporting smaller field hospitals. We run two specialist pediatric hospitals in Atmeh and Jabal al-Zawiyah. People are coming from so far around to the Atmeh hospital that we’ve had to put signs up on the roads leading to it. We have also opened a women’s unit with trained midwives and obstetricians to help women through childbirth and to provide C-Sections. But to continue this work, and to reach even more of the population, we need your help. Small donations can help provide medicine for basic illnesses, nutritional bars and solution to bring malnourished children and babies back to a healthy weight, and training for new doctors to help them deal with conflict related injuries. Every day, lives are being ruined by starvation and disease as much as by the violence of the war. By simply providing medical aid and sustenance, so many of these lives can be saved. A child dies every 50 minutes in Syria – but they needn’t. Many of these deaths are entirely preventable, and it is still within our power to help. We cannot let those inside Syria be forgotten. Please, donate what you can. Emma Pearson and Katie Welsford are freelance journalists and researchers, and volunteers at Hand in Hand for Syria.